July 30, 2018—-The Holocene is the last currently recognized geological epoch. Holocene means “entirely recent.” It is also the shortest. As between other epochs interconnected events mark the boundary between the Pleistocene and the Holocene. Climatic change was a key factor at the boundary. Toward the end of the long retreat of the ice, the climate alternated between warm and cold. The ice sheets began to melt rapidly about 14,000 years ago. During the initial phase of melting in North America the water created two rivers now known as the Missouri and Ohio. These two rivers formed at the front of the ice sheet. These rivers joined into what is now the Mississippi River. The volume of water in the Mississippi must have been tremendous based on the width of the Mississippi River Valley. So much fresh water flowed into the Gulf of Mexico that it altered both the salinity and temperature of the Gulf. As the sea ice melted in the Atlantic, the southern limit retreated northward allowing warmer water from tropical regions to flow further North. The clockwise circulation around the North Atlantic including the Gulf stream developed. The weather patterns around the North Atlantic Ocean came into existence that were much like those of today. Lessons from the fossil record: Discarded consumer good. anthropocene layer in the rock strata. By 11,500 years ago, only scattered areas of ice sheets remained in western North America. The main ice sheet was in eastern Canada. Real warming of the northern hemisphere could not take place until most of the ice had melted. However, at about this time a fairly rapid reversal of the melting took place. The edges of the ice sheet moved towards the equator once again and some small ice sheets reappeared. This cold period became known as the Younger Dryas event, (named for a small flower found in cold climates). The warming was not a global event. It took place mainly around the North Atlantic Ocean. Evidence of glacial ice at this time is found largely on Greenland, maritime Canada, and northern Europe. The human impact on our earth. Seven thousand years ago conditions had warmed again such that only remnants of the ice sheet remained. The warming peaked about 5500 years ago. Basically, only the Greenland ice sheet and the ice on the Antarctic continent remained. Although it varied in intensity and timing from place to place, the warming was a global event. Mean atmospheric temperatures were warmer than today and the term climatic optimum or thermal maximum was coined to describe this period. In Europe temperatures averaged two to three degrees Celsius (5 ½º F) above the present. There the tree line was some 100 meters (330 ft) above that of today. In Africa there was a rapid drying and expansion of the Sahara Desert. Evidence indicates a major migration out of settlements in the region as food supplies dwindled. Remnants of these settlements are scattered over much of the region. The human impact on Earth. 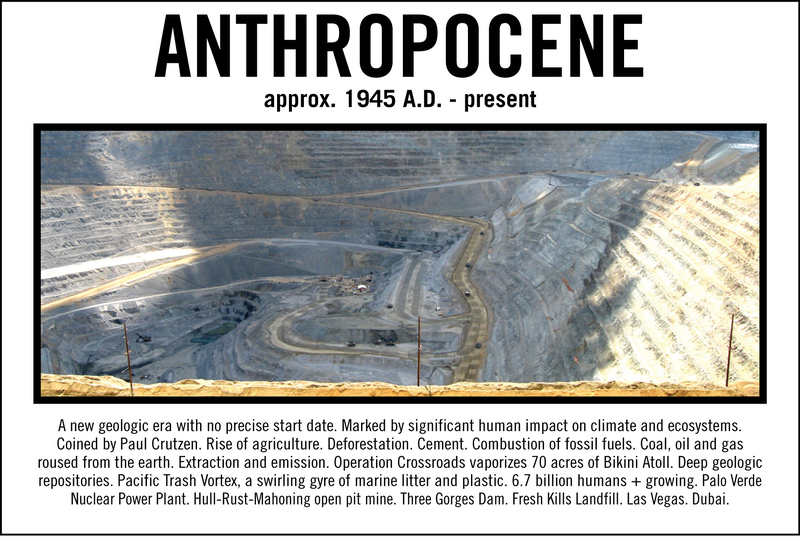 The Anthropocene is the name given to a recently proposed epoch that coincides with the impact of the human species on our planet. Boundaries between epochs have been placed where there was a significant change in the environment. There is justification for the creation of the new epoch. With the advent of agriculture, human alteration of the environment began to take place quite rapidly. A major problem is that there is no agreement as to where the boundary should be placed. Some argue that it should be placed at the beginning of the Holocene some 14,000 years ago. Others advocate placing it at the beginning of the Industrial Revolution around 1780. 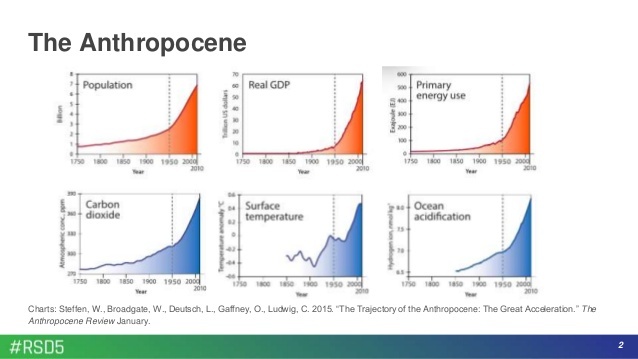 There seems to be agreement that the Anthropocene, if it becomes a recognized epoch, should coincide with some stage in the technological development of the human species. The recognition of the Anthropocene as an epoch is yet to be determined. Categories: Climate Change, Extreme weather | Tags: #climatechange, Environment | Permalink.